In four days and three nights, you will experience an elephant encounter, visit the wildlife sanctuary at Klong Saeng where you can also undertake a one-of-a-kind nature trek for wildlife observation, and explore the lake via kayaking. The package also includes a safari, and an overnight stay on the lake on floating bungalows. Rates quoted are per person and include activities as listed below, accommodations, and three meals daily. Services of English-speaking guides are also included. Enjoy a leisurely breakfast on your first morning. 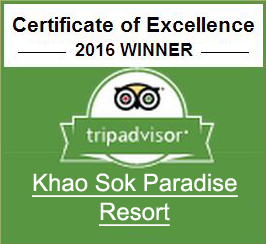 The staff at Kao Sok Paradise Resort will take you to your first adventure: an unforgettable, up-close encounter with elephants in a dedicated wildlife sanctuary. Unlike the cruel elephant rides many tourists experience, these placid pachyderms enjoy a dignified life free from the cruelty they experience from a very young age. In the evening, you can partake in an intimate elephant encounter by assisting in their bathing and feeding time. Cap off the day’s thrills with a luxurious sleep in your chosen jungle lodgings. Wake up to the anticipation of discovering various animals that are so rare they are actually endangered, including the barking deer, the royal hornbill, white-handed gibbon, rhinoceros hornbill and more wild elephants. These unique creatures can be sighted at the Klong Saeng Wildlife Sanctuary that is accessible via two-hour boat ride. Lunch will be in the raft house followed by a guided trek led by a jungle specialist and an armed ranger. Extend this observation tour by paddling a canoe on the Lost River. 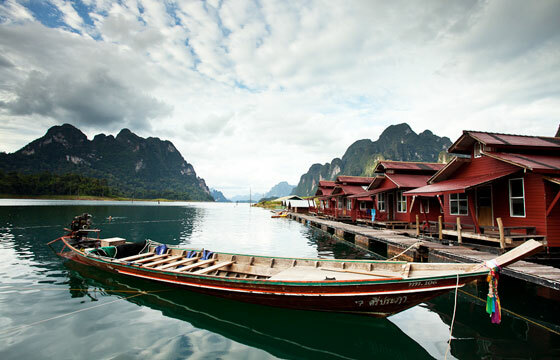 At day’s end, unwind in a uniquely Kao Sok way on floating raft houses. Luxury tents are also available but must be requested ahead of time. Dress for a daybreak safari at Klong Saeng guided by our experts. Put in more canoeing time after which your guide will take you for your up close and personal encounter with the locals at the Baan Takhun, a local market. Experience authentic local fare then wind down in the privacy of your resort accommodations. Take to the Sok River in a canoe right after breakfast and luxuriate in the unspoiled beauty of the world’s oldest rainforest. Come well prepared to document the sights of limestone cliffs. The views from the Khao Sok viewing point are priceless.